Golden Mountains (Mini-Painting as of Dec. 21, 2013), a photo by randubnick on Flickr. Here's another miniature painting, as it looked on December 21. This is oil bar on a canvas that is 3 inches square. I have been working on these small paintings as a way to finish up when I have been working on larger paintings. I added some lights and darks to this one, and it is still a work in progress. I am working from imagination here, and from golden memories of the mountains in my home state of Colorado. Landscape with Green Field (Mini-Painting as of Dec. 21, 2013), a photo by randubnick on Flickr. Obviously, this miniature painting is a work in progress, just barely started on December 21, 2013. This is painted with oil bar on a canvas that is only 3 inches square. When I am working on larger paintings, I often end the painting session by working on these mini-painting. This one is to be continued. . . . 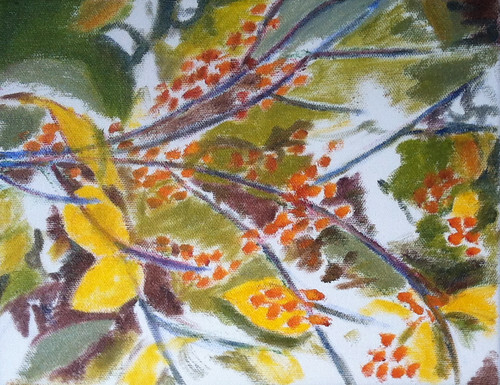 Branch with Golden Berries (Oil Bar Painting as of Dec. 21, 2013), a photo by randubnick on Flickr. Here is the oil bar painting I have been working on, as it looked on Dec. 21st. At that point, the composition was basically in place, and I began to work on clarifying lines and shapes. This painting is loosely based on one of my posterized photos, published here on the first of December. Sun and Water (Mini-Painting as of Dec. 15, 2013), a photo by randubnick on Flickr. Here's another miniature painting that I started back on December 15, 2013. This is oil bar on a canvas that is 3 inches by 3 inches. This is a work-in-progress, barely begun in this photo, but will be a landscape of sunlight on the ocean. At Galatea Dec. 27, 2013, a photo by randubnick on Flickr. I took this photo today at Galatea Gallery. 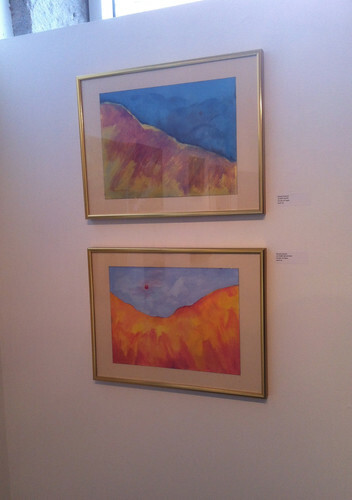 These are two of my acrylic mountain paintings, on display for the "Smaller Works Show". I meant to take a picture at last weekend's Open House, but I forgot. But since I had to drop something off today, I had another chance. Good thing, too, because this show comes down on Monday. 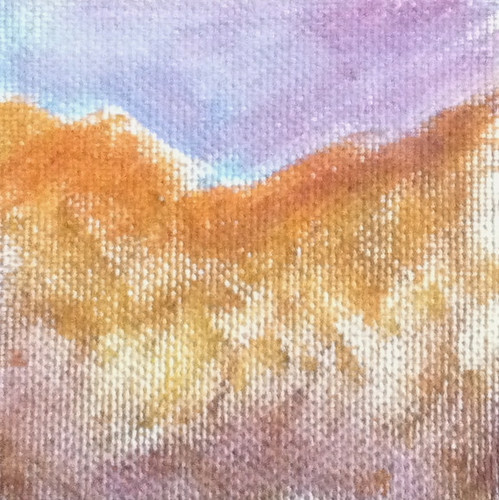 Golden Mountains (Mini-Painting as of Dec. 15, 2013), a photo by randubnick on Flickr. This is a work in progress, another miniature painting that I started on December 15. 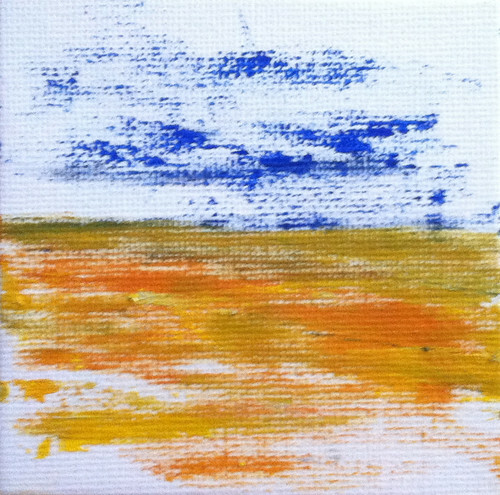 This is oil bar on a 3 inch x 3 inch canvas. I am working from imagination, inspired by memories of the mountains in my home state, Colorado. Storm Watch, a photo by randubnick on Flickr. Winter Storm Watch a video by randubnick on Flickr. 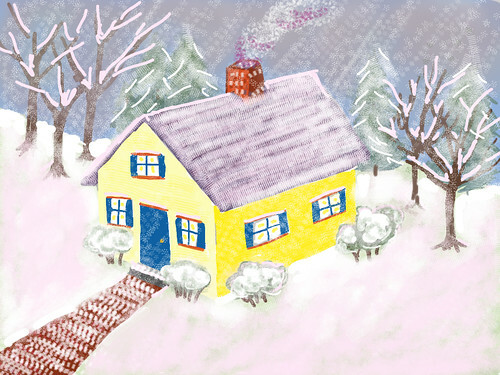 I used the Brushes app on my iPad to draw this snow scene. The Brushes app captures a stroke-by-stroke video as you draw. So I am sharing this with warm wishes ofr friends and family. To watch this winter storm, just press play. 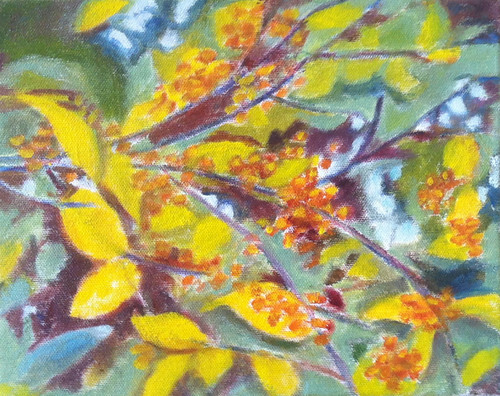 Branch with Golden Berries (Oil Bar Painting as of Dec. 15, 2013), a photo by randubnick on Flickr. Here is my oil bar painting, still a work in progress, as it looked on December 15th. I am using one of my photos as a reference (posted here Dec. 1.) At this point--with the lines, shapes, and colors of the composition basically established--I worked on sharpening some of the edges, and adding definition to branches and berries. 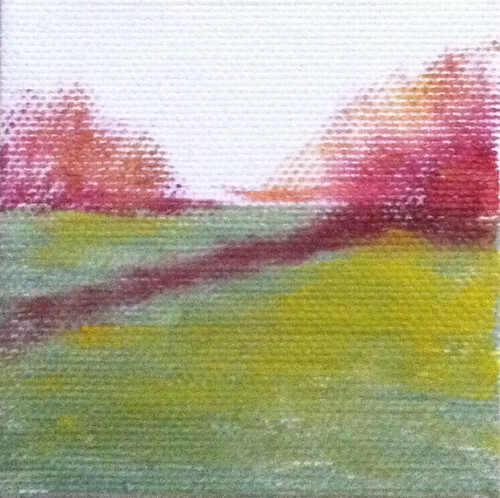 Spring Field (Mini-Painting), a photo by randubnick on Flickr. Here is another of my miniature paintings as it looked on December 13, when I finished it. That day, I was trying to complete several of these little paintings so I could show them at Open Studios as Porter Mill, then following day. This is oil bar on a canvas that is three inches square, and is painted from imagination. 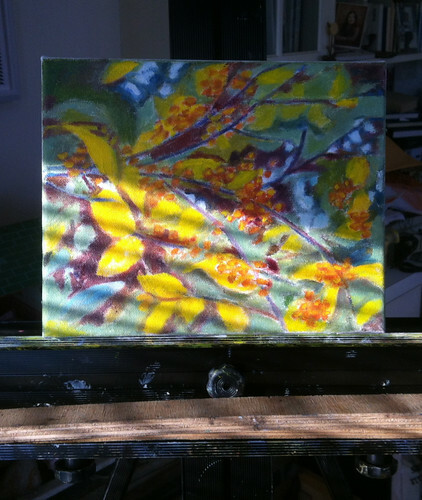 Branch with Golden Berries (On the Easel, Dec. 13 2013), a photo by randubnick on Flickr. This is the oil bar painting I have been working on. On December 13, I had already finished painting (and had already taken a photo of what I had done), but I caught a glimpse of my painting in with sunlight and shadows from window blinds hitting it. I liked seeing my painting this way so I took this picture because it captures just a tiny bit of the happiness of painting. 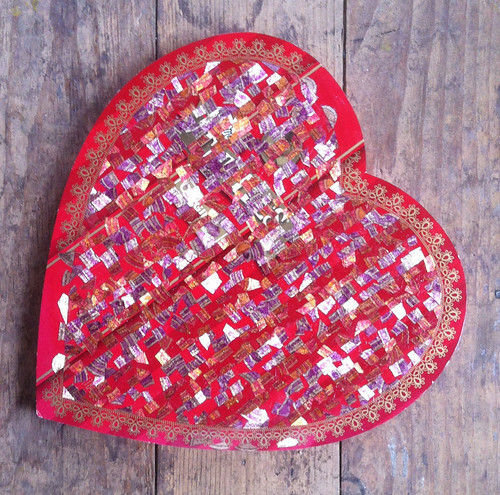 Another Heart Shaped Box as of December 20, 2013, a photo by randubnick on Flickr. 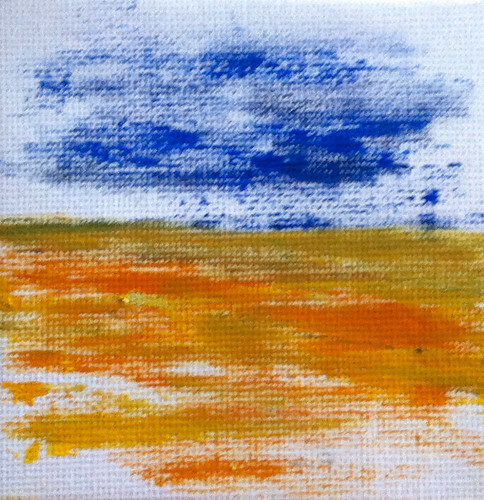 Blue Sky Golden Field (Mini-Painting as of December 13, 2013), a photo by randubnick on Flickr. Here is another miniature painting as it looked on December 13. That day, I was trying to finish some of these tiny paintings because I wanted to show them at Porter Mill's Open Studios the following day. Like the others, this little landscape is done with oil bar paint on a canvas that is 3 inches square. 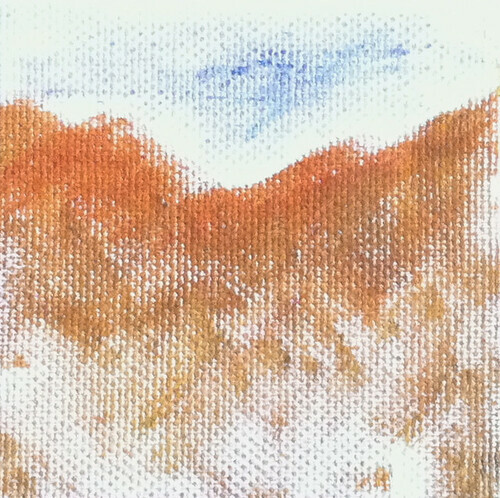 Red Mountains, Brown Field (Mini-Painting as of Dec. 13, 2013), a photo by randubnick on Flickr. This is one of my miniature paintings as it looked on December 13. This is oil bar on a canvas that is 3 inches square. I was trying to finish up some of my mini-paintings for Open Studios. For this one, I added color to the sky and a red sun. Golden Branches (Oil Bar Painting as of Dec. 13, 2013), a photo by randubnick on Flickr. 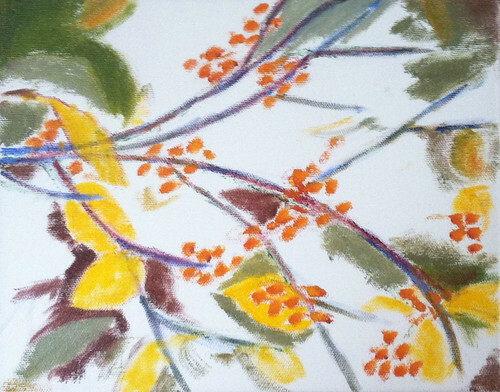 This is my oil bar painting of a branch with golden berries as it looked on December 13. I worked on adding more contrast to make the flow of the leaves show up, and the painting began to look the way I hoped it would. I am using one of my photos as a reference and for anyone who wants to see, it is posted here on December 1. 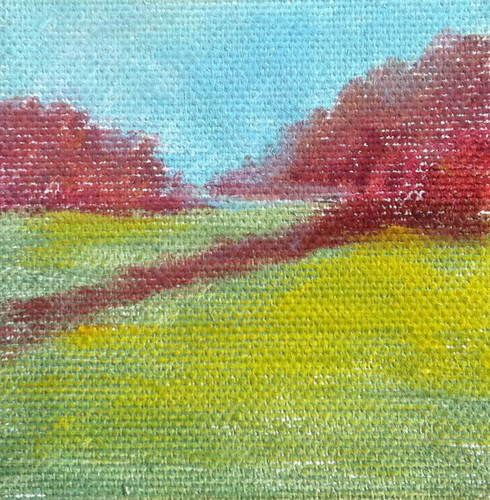 Spring Field (Mini-Painting as of Dec. 10, 2013), a photo by randubnick on Flickr. Here is another miniature painting as it looked on December 10th. Like the others, this little painting is oil bar on a canvas that is 3 inches square. This is from imagination, but the scene makes me think of spring. 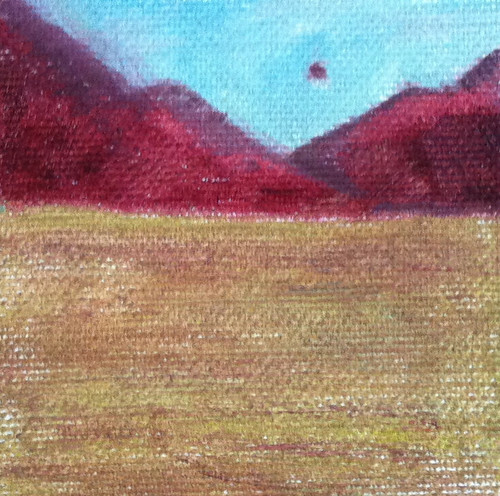 Red Mountains Brown Field (Mini-Painting as of Dec. 10, 2013), a photo by randubnick on Flickr. This is another miniature painting that I started on December 10, also oil bar on a canvas that is 3 inches square. I am painting from imagination here, but the imagery comes from memories of Colorado, my home state. Boulder Daydream (Mini-Painting as of Dec. 10, 2013), a photo by randubnick on Flickr. 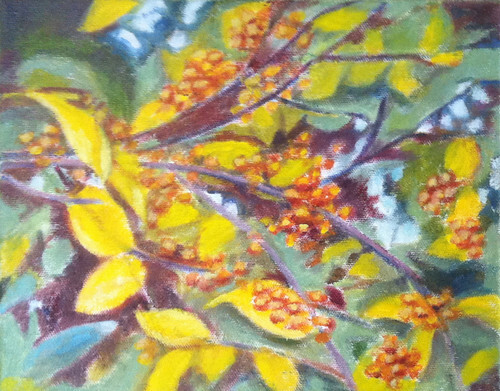 Branch with Golden Berries (Oil Bar Painting as of Dec. 10, 2013), a photo by randubnick on Flickr. This is my oil bar painting in progress as it looked on December 10. This painting is loosely based on one of my posterized photos (published here December 1). It had been several days since I had worked on this painting. (The previous session was December 6.) Of course, I was busy with other things. But I think I was also frustrated because I seemed to be losing the composition as I added colors to the background. So on December 10th, I began with the main focus, those golden leaves and berries, and revised my placement decisions until I began to get those long lines of yellow and gold. So even though I continue to use the reference photo quite a bit, my emphasis shifted to the composition on the canvas. By the time I was finished painting for the day, I felt things were back on track. 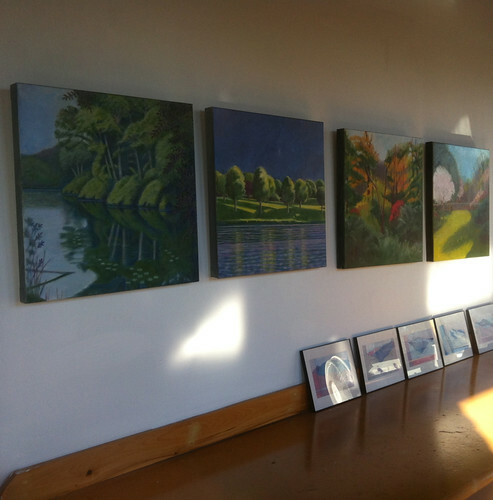 New Paintings for Porter Mill Open Studios Dec. 2013, a photo by randubnick on Flickr. Boulder Daydream (Mini-Painting as of December 6, 2013), a photo by randubnick on Flickr. Here's another miniature painting that I worked on last Friday (December 6th). This is oil bar on a canvas that is approximately 3 inches square. On Friday I added some blues and purples to the sky, and added some brown and purple to the mountain. I am working from imagination, but this reminds me of the Flatirons near Boulder, where I spent several years as a student. 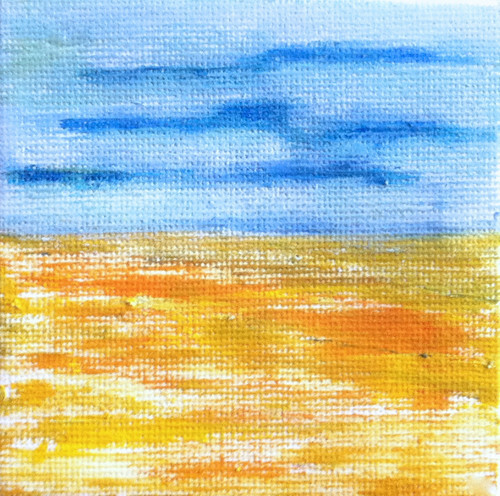 Blue Sky Golden Field (Mini-Painting as of December 6, 2013), a photo by randubnick on Flickr. 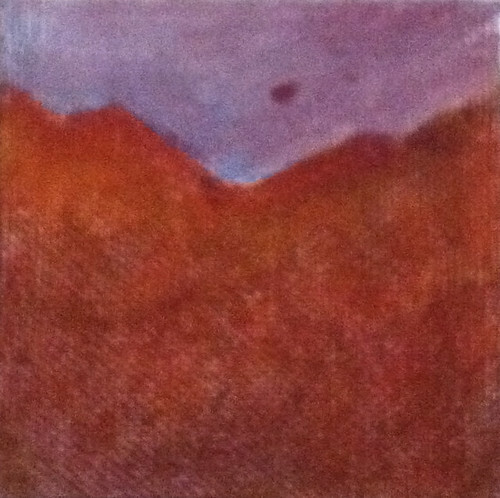 This is one of my miniature (3 inches square) oil bar paintings as of December 6, 2013. 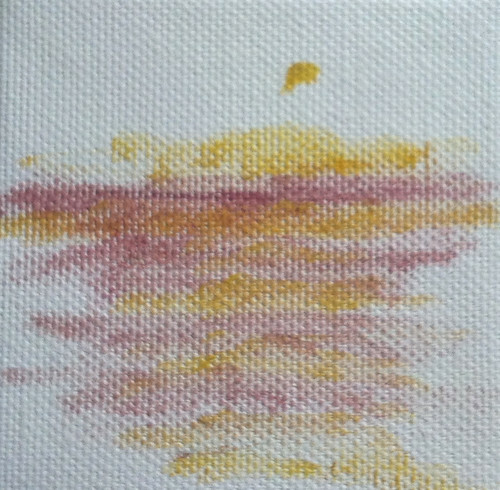 I brought the yellows and oranges of the field to the bottom of the canvas. I also added some light blue to the sky, trying to retain the shapes of the original strokes of dark blue. (I wanted to soften that electric blue a bit, but may bring just a little more of it back in.) 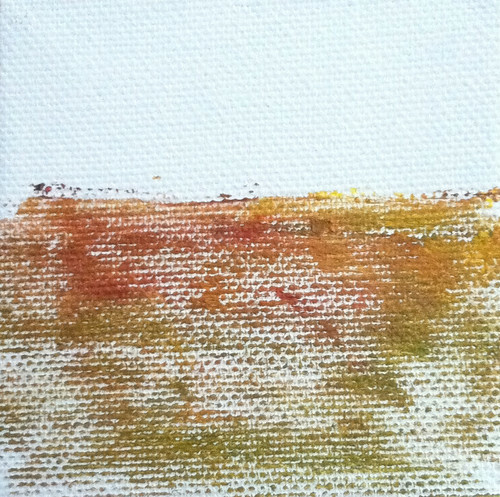 I create these tiny paintings at the end of my painting sessions, working from memory and imagination. 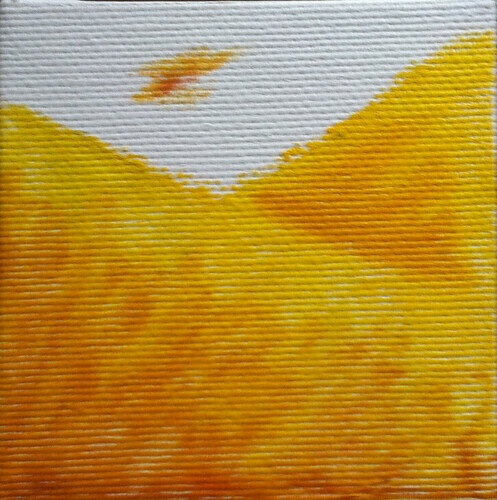 Some have suggested that this little painting looks like Kansas. No doubt I am drawing from visual memory of big sky, flat horizon line, and low clouds, that I saw often during road trips from Kansas (Emporia and Lawrence) to Colorado. 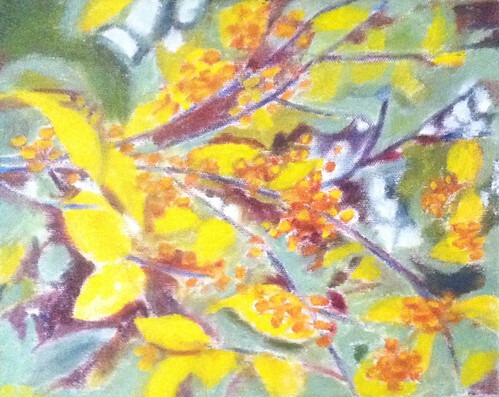 Branch with Golden Berries (Oil Bar Painting as of Dec. 6, 2013), a photo by randubnick on Flickr. This is my oil bar painting as of December 6. I have been trying to lay in the background, finding darks and lights. (I am using one of my posterized photos as a reference, posted here Dec. 1.) It is fun getting lost in all those leaves, but I think the next step will be to simplify the background and re-emphasize the main lines of the branches. There are also some adjustments that I want to make to the composition. Boulder Daydream (Mini-Painting as of December 4, 2013), a photo by randubnick on Flickr. 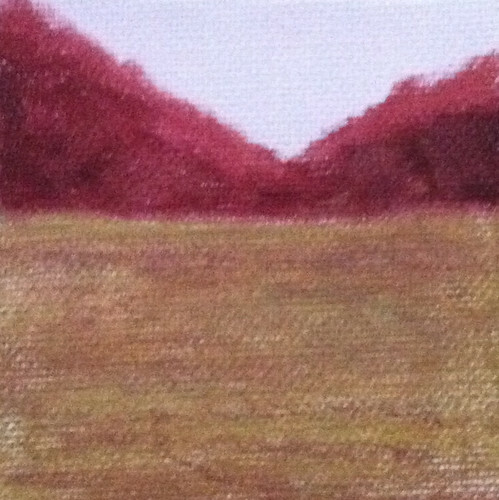 This is another tiny (3 x 3 inch) oil bar painting that I started on December 4th. I have been ending my painting sessions by working on these tiny paintings, often using whatever color is left on my brushes that day. I call this one "Boulder Daydream" because the silhouette of the mountains reminds me of the Flatirons. 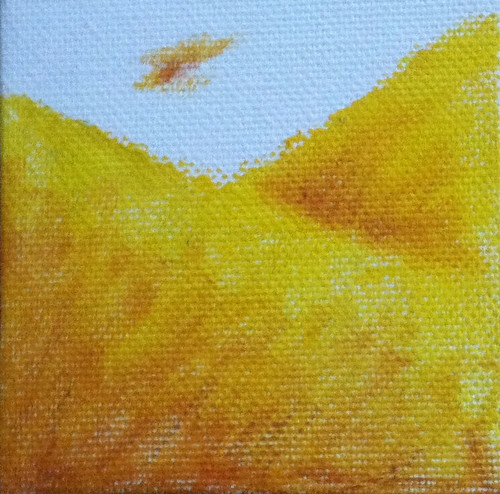 This is a work-in-progress. . . .
Blue Sky Golden Field (Mini-Painting as of December 4, 2013), a photo by randubnick on Flickr. Here is my miniature painting as it looked on December 4th. This little landscape is oil bar on a canvas that is 3 inches square, and it is still a work in progress. On the 4th, I added a bit more color to the field and sky, but I am planning to tone the sky down before I am done. Branch with Golden Berries (Oil Bar Painting as of Dec. 4, 2013), a photo by randubnick on Flickr. Here is my oil bar painting in progress as it looked on Wednesday (Dec. 4). That day I was still working out placement and composition. I used some purple to indicate where the shadows should be. I am using one of my posterized photos as a reference (posted here Dec. 1) and you can see plenty of purple in the shadows. 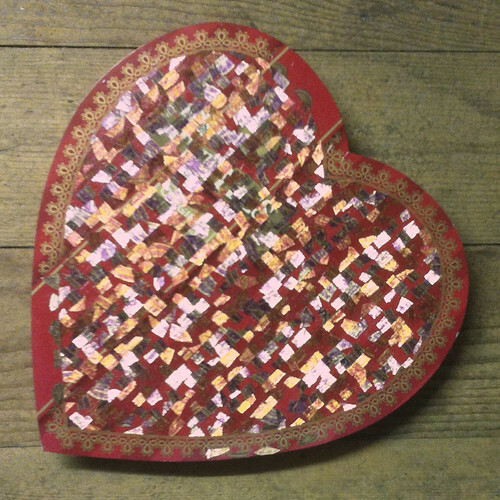 Another Heart Shaped Box as of December 4, 2013, a photo by randubnick on Flickr. 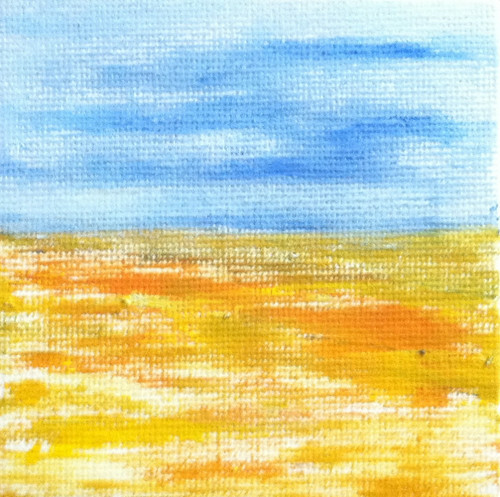 Blue Sky Golden Field (Mini-Painting as of December 3, 2013), a photo by randubnick on Flickr. This is a work in progress, a new miniature oil bar painting that I started yesterday. The canvas is only 3 inches square. Branch with Golden Berries (Oil Bar Painting as of Dec. 3, 2013), a photo by randubnick on Flickr. This morning I worked on this oil bar painting for about an hour. This is loosely based on one of my photos, originally taken in October of 2009. (I cropped that version to get the reference photo, posted here Dec. 1, 2013.) Today I continued to work on composition, starting with placement of the main branches, and then the berries and yellow leaves. 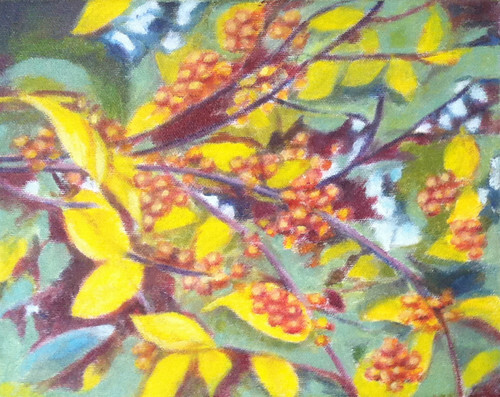 Branch with Golden Berries (Oil Bar Painting as of Dec 2, 2013), a photo by randubnick on Flickr. I was determined to get my new painting started today, even if I was short on time. So I took a few minutes to start roughing in the composition. 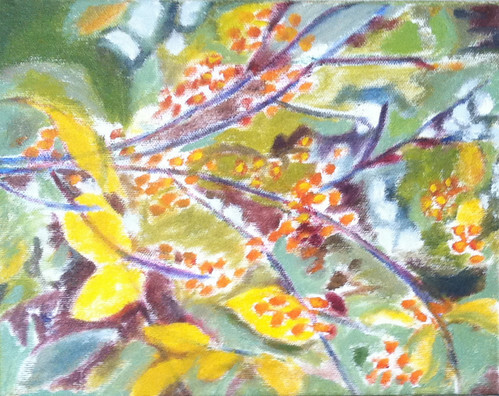 This painting will be loosely based on my photo of a branch with golden berries (published here yesterday). I only put down a few lines, but of course, I already want to make changes. But it is good to get started, anyway. Golden Berries (Posterized) for Painting, a photo by randubnick on Flickr. I am planning to start another oil bar painting this week. 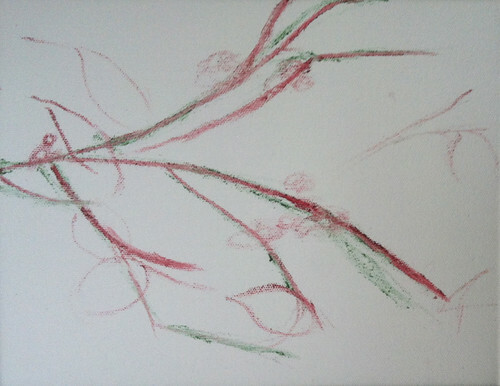 I want to do another smaller painting (8 x 10) of branches, this time with berries. Tonight I found the photo I will use as a reference. 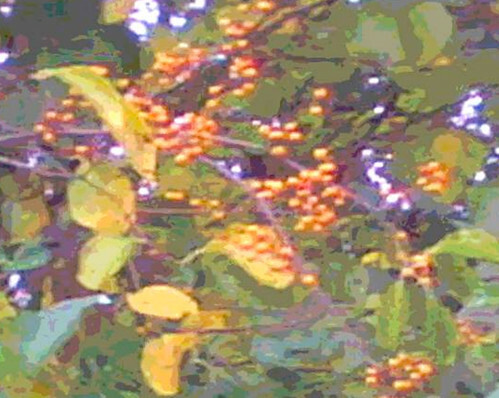 Back in October of 2009, I took a photo of golden berries and posterized it. I really like it, but the resolution is very low and it will only print a very small copy. So I played around with it in Painter, trying to increase the resolution with posterizing, and when I had done all that I could, I cropped it to get a composition that would work in an 8 x 10 inch format. And here it is.